Organic listings (also called "natural listings") are a list of web pages (URLs) that are listed according to each site’s relevance to the query as determined by the search engine’s algorithm. Organic listings are free in the sense that web site owners do not pay the search engines for ranking or traffic. Figure 1.x shows the basic operation of an organic listing. 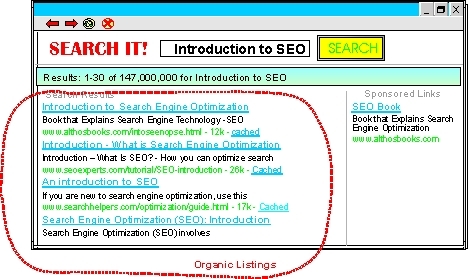 This diagram shows how a user has searched for "Introduction to Internet Marketing" and how it is listed in the organic (typically unpaid) section of the search results.